As Visallo’s search interface includes more and more features, recreating that query that was just right can take more time. The latest version of Visallo now includes the ability to save your searches. Property filters have also been expanded to include “has” and “does not have” filters. This allows you to search for elements that have or do not have a given property set. 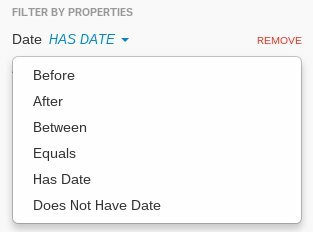 Finally, date search has been improved to support relative dates. Now in combination with the saved search feature you can create a search that is dynamic depending on when it gets executed.